There are endless jokes about mother-in-laws. Some kind, some not so kind. Unfortunately, many are well deserved. 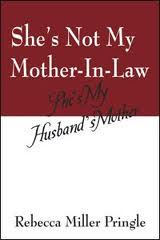 In her memoir, SHE'S NOT MY MOTHER SHE'S MY HUSBAND'S MOTHER, author Rebecca Miller Pringle exposes her hostile relationship with her husband's mother in the hopes that her story will help other daughters-in-law. Miller Pringle is a Latina with two sons, who falls in love with a 37-year-old white man, divorced with two daughters of his own. Unfortunately, their life together is marred by a prejudice and antagonistic mother-in-law, who does everything in her power to break them up -- telling lies about her to family and friends; not inviting her to family functions; forgetting her birthday but remembering the ex's; refusing to go to family counseling; and more cruelly, trying to separate a father and his daughters. Miller Pringle's best advice: "Be ready for anything, but do not tolerate everything. Demand respect and give respect." ABOUT THE AUTHOR: Miller-Pringle, born of Puerto Rican parents, is a Desert Storm Army Veteran. She was awarded an Army Commendation Medal, two Army Achievement Medals, and a National Defense Medal. She helps veterans as a peer support counselor with Vets4Warriors. Miller Pringle is a bilingual mediator and arbitrator in the state of Georgia, experienced in working with families facing divorce or child custody disputes. She and her husband volunteer for the court advocating for abused and neglected children. Miller Pringle is currently working on her second book of the “She-Not” series. She anticipates a release in early 2013. Her co-author, Dr. Johnny Velazquez, is not only her cousin, but also one of her biggest fans. In this new book, they help stepmothers with the bumps and bruises of trying to blend a family together. Follow her on Facebook @miller.mediators and Twitter @latinamediator.